Challenge contre la Faim (Challenge Against Hunger) has blown out its tenth anniversary candle this year. 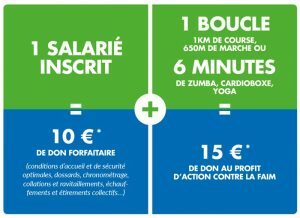 Launched in 2007, this solidary sporting event geared towards businesses brings together thousands of employees all over France: running, walking, Zumba, yoga, French boxing, Tai Chi being just a few out of a whole range of sports activities on offer. This is an opportunity for companies to participate in a fun, multi-sport solidary team-building event. Challenge contre la Faim (Challenge Against Hunger) enables the company to affirm their commitment to supporting Action Against Hunger. The company sponsors their employees who choose one of the sports proposed by the town (running, walking, Zumba, yoga, French boxing, Tai Chi, indoor multi-sports, amongst others). The volunteer teams from Action Against Hunger take part on the day to liven-up the event and support the participants so that everyone has a really great time. It is thanks to the effort put into this project and the backing of the companies, that Action Against Hunger is able to raise funds for developing their humanitarian aid missions. Every year, two programs in two targeted countries supported by our Association receive a part of the donations collected (50%). These donations also help us to react quickly to emergency situations and send adequate human and material resources. Challenge contre la Faim (Challenge Against Hunger) gives companies the opportunity to finance a team-building exercise for their employees for the benefit of the most deprived. In 2016, 5,550 employees from 185 different companies participated in this Action Against Hunger fund-raising event. In total, this 9th edition of the Challenge has collected 1,000,000 euros thanks to the great efforts of those employees sponsored by their company. The proceeds from this event have been destined to help our missions in Madagascar and Djibouti. 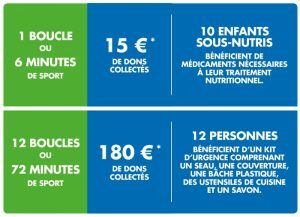 Join us at the 11th Edition of this Challenge contre la Faim (Challenge Against Hunger) in 2018 and make it the solidary sporting event of your company. For more information visit www.challengecontrelafaim.org.